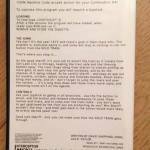 12/12/14 – News and photos to prove game existed in prototype packaging form! Ah… I remember going up to London one day and my dad buying me a copy of Your Commodore on the train journey up to keep me quiet. It happened to be the last ever issue as it happened, and on the covermount were some memorable games for me and my childhood. 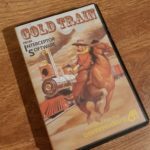 One such title was “Gold Train”, which was a slightly odd title and there always seemed to be a bit of mystery behind it which troubled me for many years. You play the game and one thing you’ll notice is that it has no sound or music at all… like it is unfinished. The title screen has the original 1984 date to indicate that this was infact something never released until now. The game itself was fully playable, and seems to be an unofficial arcade conversion (The title escapes us for now). 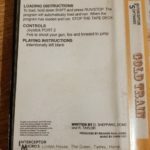 Many years later in 2008… I found Gold Train and had a play for old times sake. The questions still remained to me about the game and why it wasn’t released in 1984. I dug around in a machine code monitor, and finally the mystery was starting to unravel itself. 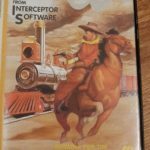 The programmer, Richard Taylor had left a message in the game to say that it was meant for Interceptor Software and it was unfinished. Ah ha!… we were infact looking at yet another GTW, and this time an Interceptor title! “Well this is the ‘story’ of Gold Train. Back in 1983 there was a little group of us c64 owners that used to get together to try and design and write games. One of the gang knew Richard Paul Jones from Interceptor Micros. He was a few years older than us, about 18/19 I think. He was cool, friendly and encouraging. He said he’d buy games from us if we produced them to a certain standard. He saw Gold Train and several others in very early stages. He wanted to buy them and he gave us each a cheque for about £500. It seemed like a lot of money back then! Esp to a 13 year old. One day a disk got dropped off with some music on it. You might be right about the author, but sadly I can’t remember. We put the music into the game. I think it was Camptown Races, or something similar! A little while later a couple of posters turned up for the game, and also some dummy cassette cases with printed sleeves. There was a horse with agonised look on face jumping a ravine, and Injuns firing arrows at a train. Great artwork! I probably still have that at my mums house. Richard Jones wanted lots of changes made to the game. More shooting, more challenging obstacles. Looking back I can see his point. He wanted it all done by a certain date, in time for a computer show in London. He showed us other games he wanted to demo, like China Miner. It was really colourful and made our graphics look bad. Bizarely he also wanted reference made to camels, llamas and goats, as seemed to be a feature of Interceptor games at the time. There was a bit of a falling out over his demands. It was a mistake to take money for the game so early on. Our ‘team’ disbanded as people went to college. I tried to finish the game for Jones in early 1984 but it fell by the wayside. To RPJ’s credit he let us keep the money originally paid. 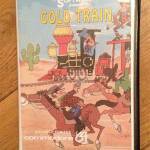 I remember him saying later that he was disappointed over Gold Train, as it was one of the best games he had ever seen, great potential. So there we have it!… it seems we have pretty much all of the game that was done… but a mention of music got us thinking. And the Camptown Races connection…. We root around Chris Cox’s music archive and find that his Fistful of Bucks set of tunes for Ocean about a year later in 1985 contain a rendition of Camptown Races. It seems that the tune for Ian Gray’s game was infact meant for Gold Train!… maybe the sub tunes too? We will need to find Chris Cox or Ian Gray someday to find out more. Additionally Richard spoke about cover art for the game being produced… and he has kindly offered to take a look when he’s next at his parent’s house to see if anything still exists. And it does! 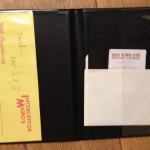 In the images section below are a set of photos of Richard’s mastered disk copy. It is believed that the game will have the completed music, so we hope to see a copy of it made soon to preserve as well as full scans. A great story to a long buried game… and we hope there is more to it soon!